Women’s Size Divider Packs are a useful, cost effective way to allow your customers to see where their size is on the sales floor. Size dividers will keep your merchandise organized and accessible. Our size dividers fit standard 1¼” hangrail (standard size for 36” round racks) and 1" square tubing clothing racks. Our dividers feature a plastic white ring with a black number indicating the size located on 4 points of the ring. 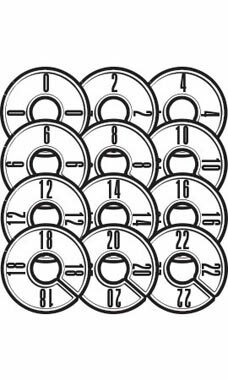 Each pack includes 3 each of the following: 0, 2, 4, 6, 8, 10, 12, 14, 16, 18, 20, 22, 24, 26, and 28.